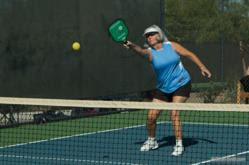 Annual National Pickleball Tournament announced for Buckeye, AZ November 4-12, 2012. The world's best pickleball players will compete in the fourth annual national tournament. The Usa Pickleball Association (USAPA) is pleased to present the 2012 USAPA National Pickleball Tournament in Buckeye Arizona with play November 4-12,. With its unique name, pickleball is rapidly growing into an international sport for players of all ages. Over 400 pickleball players will be participating in this year's National Pickleball Tournament from 31 states and provinces. Events include singles, doubles, and mixed doubles in open, senior, adult, young adult and junior divisions.